String theory is the hottest topic in physics right now, with books on the subject (pro and con) flying out of the stores. 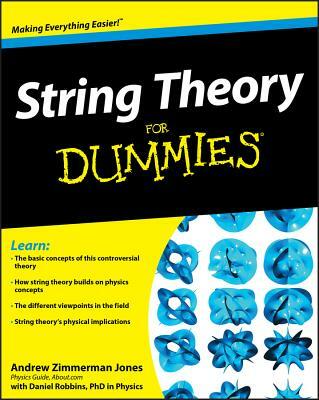 String Theory For Dummies offers an accessible introduction to this highly mathematical "theory of everything," which posits ten or more dimensions in an attempt to explain the basic nature of matter and energy. Written for both students and people interested in science, this guide explains concepts, discusses the string theory's hypotheses and predictions, and presents the math in an approachable manner. It features in-depth examples and an easy-to-understand style so that readers can understand this controversial, cutting-edge theory. Andrew Zimmerman Jones received his physics degree and graduated with honors from Wabash College, where he earned the Harold Q. Fuller Prize in Physics. He is the Physics Guide for the New York Times' About.com Web site. Daniel Robbins received his PhD in physics from the University of Chicago and currently studies string theory and its implications at Texas A&M University.